A team of model railway enthusiasts are on track for fame after winning a nationwide, televised competition. 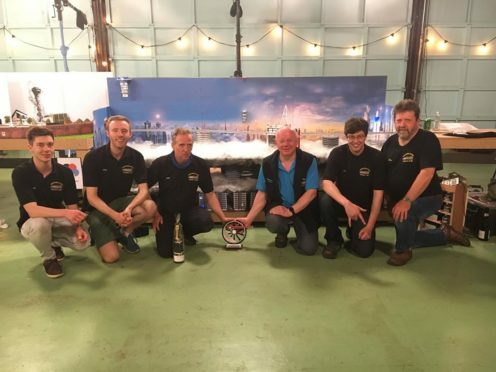 The Aberdeen Model Railway Club came in first in the 2018 Great Model Railway Challenge on Channel 5 on Friday night. The group was challenged with designing and building a brand new railway layout from scratch, with a time travel theme, within just 24 hours of the programme’s grand final. The six members reached the final stages of the contest after receiving high praise in the heats for their Clucas Bay creation, a model railway named after one of their late members. And now they have secured the title of the best railway modellers in the country, the Aberdeen team is preparing to take the winning train sets around the country to various conventions. The winning design, City of Tiers, was based on a futuristic imagining of a city of tomorrow, taking place through various tiers. Both of the club’s creations will be on show at the Warley National Model Railway Exhibition in Birmingham later this month. Team member Ewan Forsyth said: “We are incredibly proud of the team and the support after the heats aired. “It’s an incredible achievement to us, made all the more special knowing we’ve made Dave Clucas proud. “We imagine you would love to come and see our two creations Clucas Bay and City of Tiers as soon as you can so it’s our privilege to announce you can see them both at the Warley Exhibition on November 24 and 25. “We had an absolutely brilliant time participating in the show. “There were a lot of nerves beforehand, especially on the 10 hour drive in the van for one day of filming, but that turned to excitement and determination pretty quickly. “The show taught us a lot, but most importantly that teamwork is key, and that the hobby is a brilliant hobby – especially the social aspect.